Following the tragic slaying of a police officer in Georgia, another police officer has been killed—this time in Philadelphia. NBC News Channel 4 in Los Angeles reports that Philadelphia Police Officer Robert Wilson III was getting a gift to reward his young son when he was gunned down earlier today while trying to protect people inside a GameStop store in North Philadelphia. “He was making a security check and he was also picking up a gift for his 8-year-old son who had done exceptionally well at school,” said Police Capt. Darrell Clark. Wilson, an 8-year veteran with the 22nd District, died from his injuries after he was shot several times at close range during an attempted robbery inside a North Philadelphia GameStop late Thursday afternoon. The 30-year-old father left behind two young children, ages 8 and 1, as well as a grandmother. “Take a moment and say a prayer for this family,” said Philadelphia Police Commissioner Charles Ramsey. “And this 9-year-old boy who will now grow up without a father. A 1-year-old is going to grow up without a dad because of what happened today.”Ramsey did not confirm whether or not Wilson was wearing a body camera at the time of the shooting. 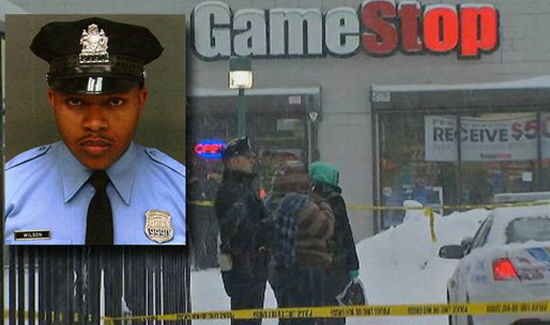 Police were able to recover surveillance video from the GameStop however. The video was reviewed by homicide investigators. Ramsey, who is part of a national task force focused on law enforcement’s relationship with the local community, also spoke on the danger police officers face on a daily basis.